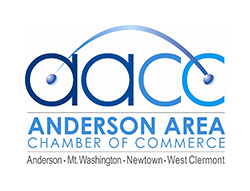 The Anderson Area Chamber of Commerce exists to advance and promote businesses in the Anderson area, enhancing our communities, where people live, work and prosper. The Anderson Area Chamber of Commerce was formed in 1970 and currently has 600 members from Anderson Township, Mt. Washington, Newtown and western Clermont County with its membership growing. Easily located off of Five Mile Rd next to the Mercy HealthPlex.